The fact that I’m not massive fans of luxury RV’s is no secret. It’s not that I don’t like them, in fact, vehicles like the Carado Axion and the EarthRoamer are works of automotive art, but a lot of large RV’s are just a bit samey. I’m sat in a camper park up spot in Spain while writing this article and every other van is large, white, and boasting a decal of a compass or a catchy marketing slogan about ‘following your heart’. Far be it for us to tell Vandwellers what vehicle to use; living the van life isn’t a ‘one size fits all’ kind of lifestyle after all, and we’ve all got different needs and wants that make up the building blocks of our alternative living lifestyle. However, if you’re adamant about getting a monster camper that will test your parking skills to the limit, then the least that you can do is get a funky futuristic camper that looks the part. Tiny homes come in all shapes and sizes, and although the Skydancer Apéro isn’t exactly the first thing that springs to mind when you think of a quirky tiny house, you certainly can’t deny that it stands out in a crowd. If you’re after a modified camper that will turn heads when you drive through quaint European villages (check out our top road trips article for some travel inspiration), then this futuristic camper will be right up your cobbled street! Check Out The Futuristic Camper Made For Adventures That Are Out Of This World. 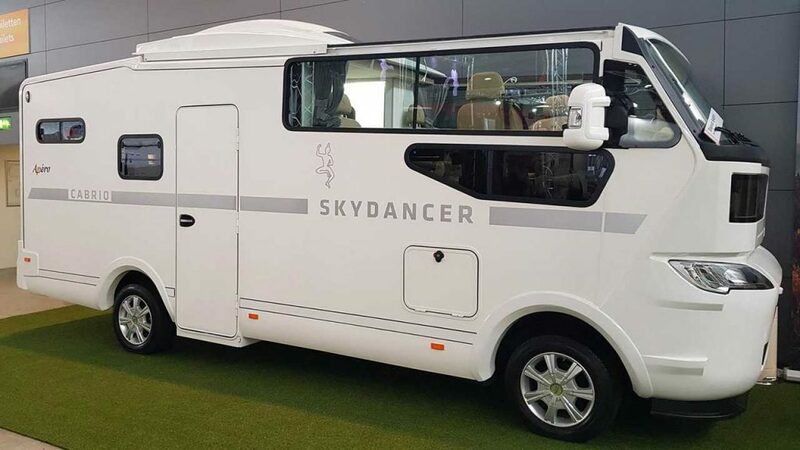 Take a look at the Skydancer Apéro, a futuristic camper that looks as though it was designed by Commander Spock and some of his Vulcan friends. I know that it’s not going to be everybody’s cup of tea, but I love everything about this weird looking camper. Not only does it maximise every inch of available space by using a layout that takes up two separate levels, but it also has a fully retractable roof! Now you can bring nature indoors on this long drives through the countryside, and I also guess it will be pretty useful to let the smoke out if you burn your toast too! This futuristic camper first made the rounds back in 2014, based around a Mercedes Atego motorhome. While the Atego didn’t make our best campervan conversions list, a lot of Mercedes Sprinter Conversions did, and they’re definitely worth checking out! Anyway, back to the Skydancer. This cosmic camper has recently re-emerged onto the motorhome scene using a frame of a Fiat Ducato, and wowed audiences at CMT with it’s may party pieces. Some of you might have read the article we did on a 4×4 Fiat Ducato Camper, and it’s hard to see any traces of the base vehicle in this intergalactic rolling home both inside and out. I guess that makes it the best example of a stealth camper van that we’ve ever covered by default; well done Fiat! Designed by Piotr Kubinski, this futuristic camper combines key aspects of modern living with all of the van life essentials that we all know and love. 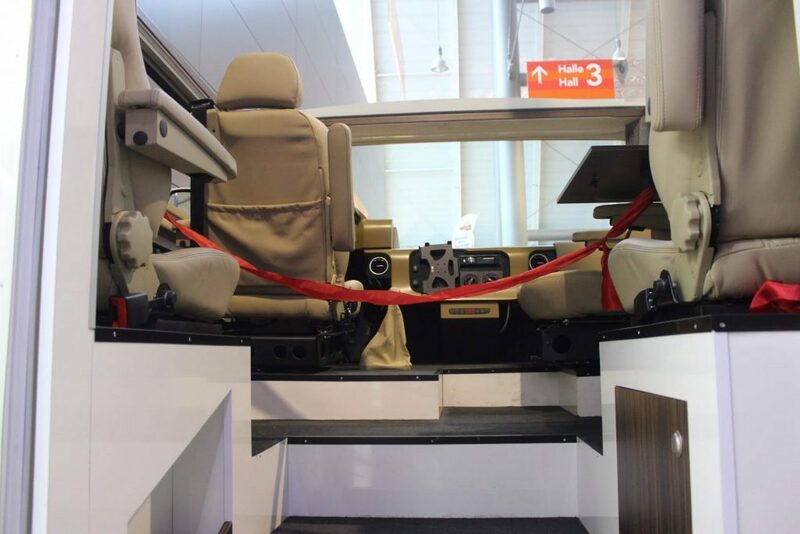 The upper deck or driver cab area comprises of four luxury leather seats to give the driver and passengers maximum comfort. It looks a little bit like you’re sat up in an aeroplane cockpit, and with the panoramic windows on all sides, you won’t fail to see stunning vistas while trundling along on your adventures. And we’ve got to talk more about this retractable roof; how many RV’s do you know that can turn into a soft top convertible? 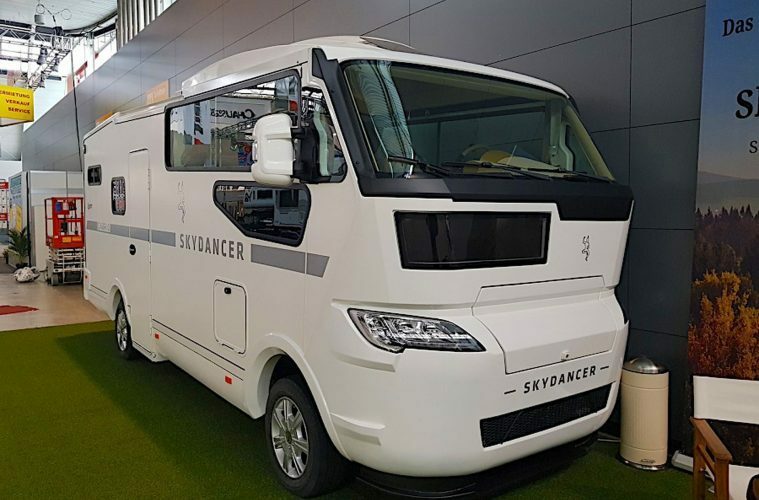 A few small travel trailers might come close, but nothing as large and majestic as the Skydancer Apéro! I wholeheartedly understand how comfortable chairs can be hard to escape from, which is why this futuristic camper also has folding tables to turn the cab area into an extra dining room. Play games under the stars, drink a cocktail while watching the sunset, or whip up a tasty salad while gazing out over a beautiful lake; with the Skydancer Apéro as your tiny home from home, you don’t even have to step out of the front door to be immersed in nature. Controlled remotely, the retractable roof can also stay off while driving. Now you can feel the wind in your hair or use the rain to wash yourself while driving (Caution – leather seats can be slippery when wet). You’ll also find a sleeping area on the upper deck too, but this stays firmly underneath a fixed roof (the last thing you want is to find a couple of crows chilling out in your bed when you park up!). It looks cosy enough, albeit a little clinical, but home touches and extra furnishings would quickly turn this bedroom into a comfortable place to chill out and catch some well-earned z’s. 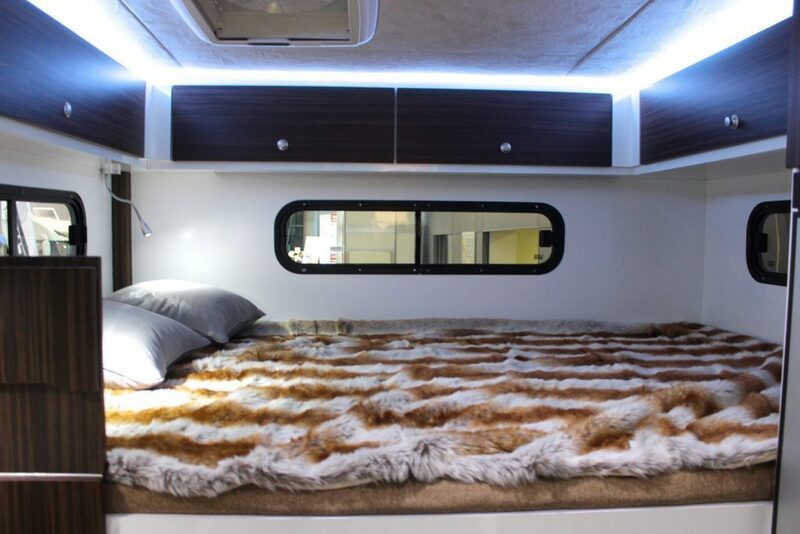 The driver cab also converts into a second bed, giving you room to sleep four people in this futuristic camper. Our advice would be to stick the person that snores in the back bedroom; you wouldn’t want a noise complaint to ruin your off grid adventure, would you? Could You Live Inside This Futuristic Camper? Yes, and you’ll find everything that you need for living and travelling in a van on the lower deck. At the front end of the camper, you’ll find the living room, which again looks spacious enough from what we’ve seen on various Van Life Instagram accounts. You can access the chill zone via a set of stairs that lead down from the cab (this thing really is big! ), or through the side door on the ‘ground floor’. The living area also holds a nifty little kitchen area that has more than enough space to store all of your top cooking accessories in it. 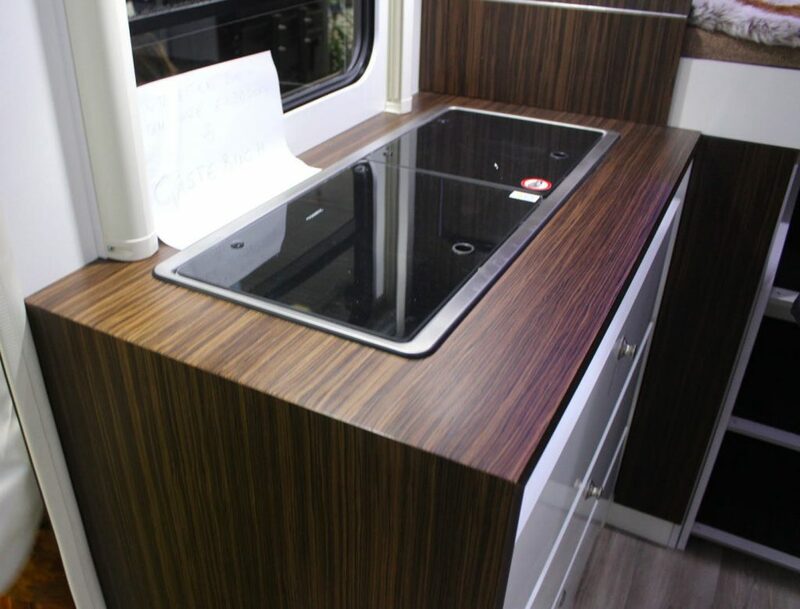 There’s a gas stove (you’ll be wanting an XL Ridgemonkey to go with it), a decent sized countertop and a fridge for your beers or hummus depending on how you like to roll. This futuristic camper also comes with a fully kitted out bathroom and shower, meaning you don’t have to grab the trowel and head into the woods when you need to do your ‘important business’. If you’re travelling for a long period of time and don’t want to use all of your water reserves up then you could also consider taking a portable camper shower along for the ride too. And the fun doesn’t stop there folks, because there’s also a garage area in the rear of the camper that’s large enough to fit skis, bikes, scooters, extreme sports gear, snowboards, skateboards and more. You could even fit a fold-up kayak in there and take a paddle into unknown waters. The Skydancer Apéro weighs just under 7’000 pounds when full of water and gas; it’s not the heaviest of vehicles that we’ve covered here at Van Clan, but I still wouldn’t want to be behind one if it stalled on a hill! What is it about this camper that I like the most? I think it’s the fact that it fills a weird gap in the market that nobody really knew existed. It’s got two levels, but it’s not a double-decker bus conversion. It’s got a retracting roof, but it’s not a sports car. If you look at the Skydancer Apéro closely you’ll see that it’s a bit of an amalgamation of lots of different ideas, and it plays heavily on a couple of gimmicks that make it stand out from its glossy white brethren. The design is fresh and looks unlike anything that I’ve seen before, and I wouldn’t be at all surprised to see some younger vanlifers behind the wheel of this futuristic camper in the near future. While I like the overall idea and concept, the price for staring up at the stars while eating a bowl of pasta may be beyond my reach for a long time. 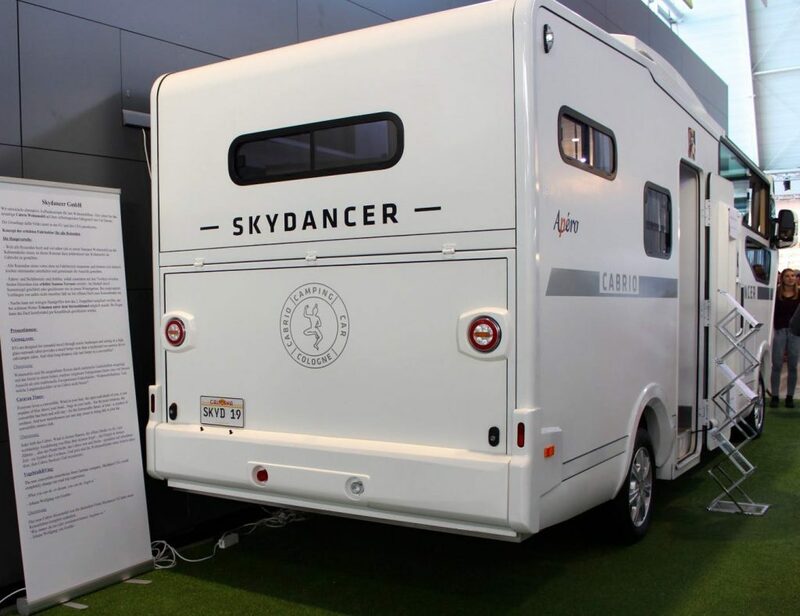 At $146,000 for the base model it doesn’t exactly come under the heading of a ‘cheap camper’, but then again, you don’t purchase the Skydancer Apéro because it’s cost effective or functional. This is a camper for the digital nomad that wants to step far enough away from the norm to give the impression of being individual, while still sticking with a tried and tested method of off grid living that provides comfort and luxury on the road. Rumours have surfaced about an electric version driving over the horizon in the not too distant future, so it could end up making our list of eco campervans before the year is out. Tell us your thoughts on this futuristic camper over on our Facebook, Twitter, and Instagram pages. Do you like it or loathe it? What would you like to see in an electric version, and do you think it will take off? Get in touch! Find out why Outdoorsy is the best place to rent an RV!